Irish Figure Painter & Illustrator. Biography, Paintings. The Irish figure painter, portraitist and illustrator Joseph Haverty was born in County Galway. Biographical details of his art education and career are somewhat sparse, however his artistic capability as a young man suggests that he absorbed the skills of drawing and painting at a relatively young age, probably from a local artist. He first came to public attention at the age of 20 when he submitted a painting to the Royal Hibernian Academy. Within a year from this he had moved to Dublin, and thereafter appears to have divided his time between Galway, Dublin and London. 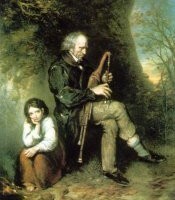 Joseph Haverty is best known for his picture "The Limerick Piper" (1844), which became one of Ireland's most famous nineteenth-century lithographs. The picture portrays Patrick O'Brien, a blind Gaelic piper from Labasheeda. It now hangs in the National Gallery of Ireland. Adept at figure painting, Haverty painted genre scenes, landscapes, personal and group portraits. One of his best known portraits was of Daniel OConnell. In addition, he became accomplished at printmaking, and lithography. Joseph Haverty must have exhibited a number of times at the Royal Hibernian Academy (RHA), as he was one of its early members. However, his paintings are relatively rare. In November 2003, one of Haverty's paintings sold for a record €227,000 at one of Christie's auctions of Irish art.  For details of other painters from Galway, see: Irish Artists: Paintings and Biographies.  For more about figurative painters like Joseph Patrick Haverty, see: Irish Art Guide.  For more about genre-painting, see: Homepage.